The Gateau Chocolat From Famous Chocolatier, “Ken’s Cafe Tokyo”, Arrives In Singapore! While other opulent bars have their chesterfield couches and mahogany shelves, hanging alabaster chandeliers and intricately carved brass tables, live jazz bands and white-glove service, The Brightside has its faux grass-covered floors, a bright yellow striped canopy that stretches out like sun rays, and unbeatable feel-good vibes that reel in even the cold and bitter. “My living room”, a regular summed up succinctly when asked by co-founder Jamie Gripton on what the five-month-old bar reminded her of. We picture The Brightside as a free-spirited bar that is unbothered by its aesthetics, but craves colours and human company, indicated by festoons of fairy lights, peculiar multi-hued art displays next to magenta-splashed pillars, and its endearingly warm customer service. 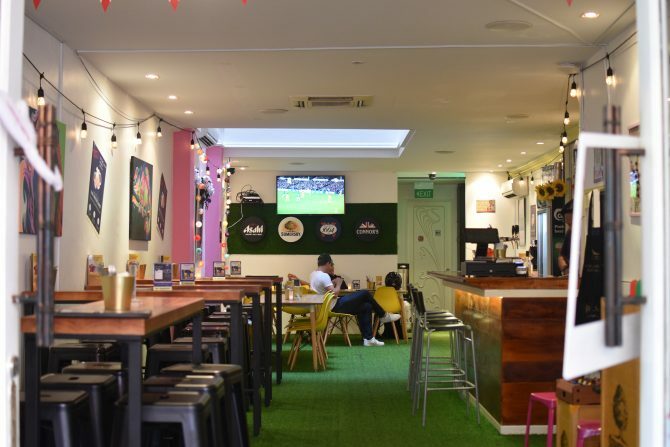 And that’s the direction Jamie is heading towards – a fun, lively and unpretentious bar that allows thirsty imbibers to take a load off from real-life shenanigans. 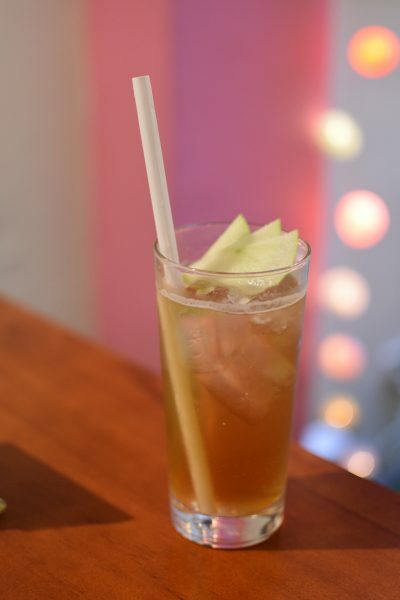 With such a casual concept also comes seriously affordable drinks. We’re talking about cocktails starting at $15. $12 if you come on Thursday! Beers, such as Asahi Super Dry and Connors Stout, are offered as well. Even at such low prices, the bar does not scrimp on the cocktail’s alcohol content. For instance, the Very Mai Tai ($15) is a silent killer, where 60% of the drink is made up of rums and Cointreau. Also in the mix are lime juice, orgeat syrup and egg whites that reflect the taste of the ice pop Solero. 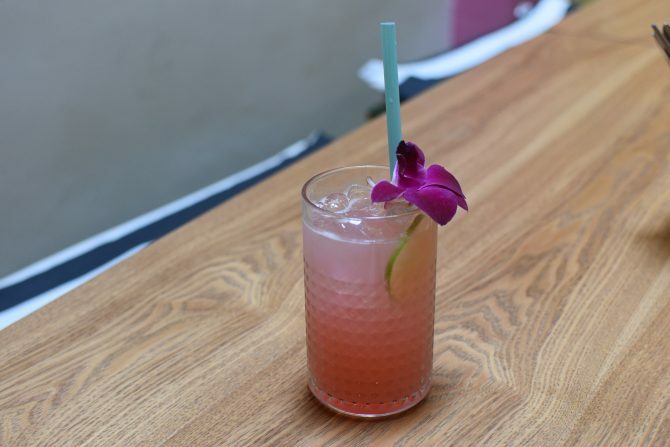 Nudge Nudge Wink Wink ($15) is also one to opt for, which likens to a spiked strawberry lemonade of home-brewed strawberry tea syrup and Sicilian lemonade. The blend is then made naughty with a copious amount of Tanqueray No. 10, cointreau. For a classic with a twist, look to the Naked And Single ($15). An adaption from a whisky highball, The Brightside’s version blends Singleton Single Malt Whisky with Nakd artesian water – a brand that Jamie brought in to Singapore six years ago. This is one drink you cannot help but smack your lips together due to the added tartaric acid for tartness. 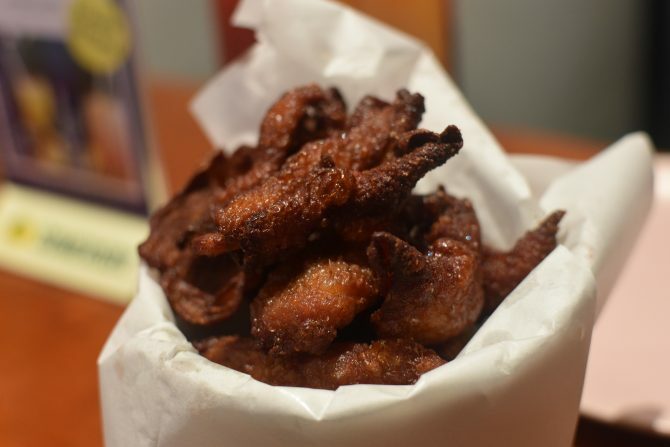 To be honest, what impressed us the most was the bar’s gloriously sinful Fried Chicken Skin ($8/$15)! Fried to perfection, the chicken skins were presented, all curled up like delicate leaves, in a small bucket. The underside of each skin still touts a thin layer of fats that made it even more indulgent. Other delectable bites also include Spam Fries ($7/$12) and Asian Tacos ($8 per piece), and even heartier options like Beef Noodle Soup ($20). So why not loosen that tie, shed the skin of pretence and head over to The Brightside? Your friendly neighbourhood bar awaits.